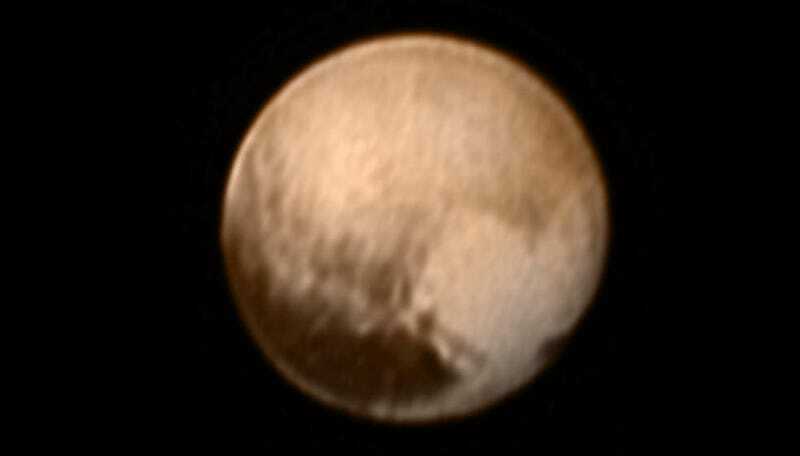 New Horizons' Latest Image Shows Pluto's "Heart"
The top image was received by NASA scientists earlier today. New Horizons was just under 5 million miles (8 million km) from Pluto when the picture was taken. It’s the first new image since the technical anomaly this past weekend. The image shows a distinct geological feature that’s very heart-like in its shape. Coincidentally, the New Horizons spacecraft will be honing-in on this area during its flyby on July 14. This image below was put together using images taken from June 27 to July 3 by the LORRI camera on New Horizons, along with low-res color data from the Ralph instrument. This whole-planet map is offering scientists an unprecedented glimpse of Pluto’s dramatic surface features. Directly to the right of the whale’s “snout” is the brightest region visible on the planet, which is roughly 990 miles (1,600 kilometers) across. This may be a region where relatively fresh deposits of frost—perhaps including frozen methane, nitrogen and/or carbon monoxide—form a bright coating. This map is great—but NASA says we should expect resolutions 1,000 times better than this in the coming days and weeks. Whoa. Note: This post was updated to include the new “heart” photo. Contact the author at george@io9.com and @dvorsky. Images by NASA/Johns Hopkins University Applied Physics Laboratory/Southwest Research Institute.